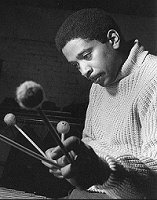 "Bobby Hutcherson can move easily across a vocabulary of such breadth that it would neutralize the identity of a less talented player." Bobby Hutcherson's ascendancy seemed meteoric to all but him. Born in Los Angeles in 1941, Bobby studied some piano at age nine. But a Milt Jackson record that he heard at age 15 drove him to music in general and the vibes in particular. By age 21, he'd played with Don Cherry and Charles Lloyd and made his recording debut on Curtis Amy's Groovin' Blue for Pacific Jazz. he also cut a tune with Les McCann's trio and started an album of his own for Pacific Jazz, with tenor saxophonist Walter Benton, that was never completed. He then joined the Al Grey--Billy Mitchell Sextet, appearing on several of their Argo/Cadet albums and touring with them across the United States. When they played Birdland, Bobby settled in New York, still a relative unknown on an instrument that was hardly in great demand. But Bobby had (and still has) a work ethic, a brilliant mind, a profound, non-ritualistic spirituality, an innate wisdom and warmth that made for the ingredients of an outstanding jazz artist as well as a hell of a human being. Jackie McLean brought him into his daring new pianoless quintet with Grachan Moncur, Eddie Khan and Tony Williams. On April 30, 1963, they made One Step Beyond for Blue Note. Upon its release that December, everyone was talking about these incredible young musicians and the barriers that they were breaking down (from within, not from without). Later in the year, Bobby made McLean's Destination Out and Grachan Moncur's Evolution with the same circle of musicians. He also participated in Grant Green's more conservative but equally stunning November sessions that produced Idle Moments with Joe Henderson, Duke Pearson, Bob Cranshaw and Al Harewood. In 1964, Bobby appeared on Andrew Hill's Judgment and Andrew! !, Eric Dolphy's Out To Lunch and Jackie McLean's Action and his reputation as a cutting-edge virtuoso was cemented. He continued to do straight-ahead dates for Blue Note with artists like Dexter Gordon, John Patton and Joe Henderson, but his first issued album as a leader Dialogue featured Sam Rivers, Andrew Hill and Joe Chambers with adventurous compositions by Hill and Chambers. When it was issued, Bobby was member of Archie Shepp's quartet. Much of his time from late 1967 was spent in Southern California co-leading a group with Harold Land. A selected discography of Bobby Hutcherson albums. The Kicker, 1963, Blue Note. Stick Up!, 1966, Blue Note. Total Eclipse, 1967, Blue Note. San Francisco, 1970, Blue Note. Cruisin' The 'Bird, 1988, Landmark.